In order to understand the dynamics of the middle east, it is necessary to understand the various ethnicity's of the people. The media and the administration are miss-characterizing Muslim terrorist groups by using their brand names instead of their religious affiliations. In any given theocracy, religious affiliations are as important, if not more important than their country of origin. In the middle east, borders of countries are not as important as religious nationalism. A theocracy is a form of government where a deity has supreme rule over its people and is governed by a set of religious laws, such as the Koran. The Kurds have a mixture of many religions including Sunni, Shia, Christian, and many off-shoots from all of those religions. Much to my surprise, while doing my research, I found that Sunni's have many more terrorist groups than Shia. The tables below show the groups and their country of origin. It should be noted, the main population of Iran is Shia. The white circle at its center, is the second part of the shahada which reads: "Muhammad is the Messenger of God." It’s meant to represent the official seal of the Prophet Muhammad, but some scholars have long debated what that seal actually looked like. 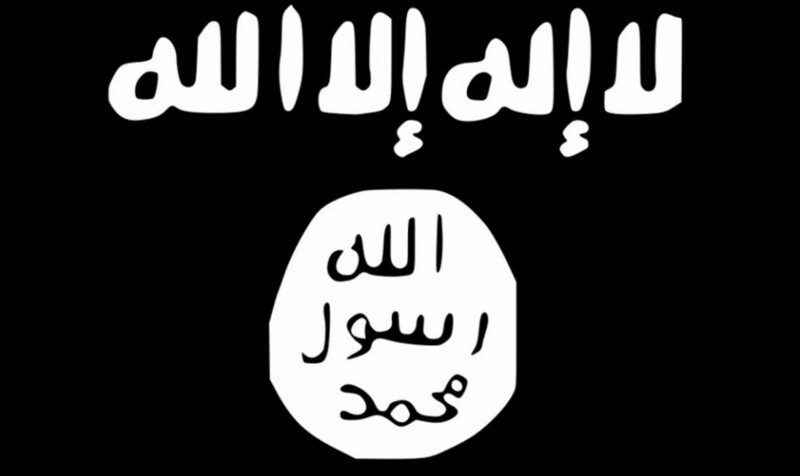 The two Arabic phrases, the black color of the flag and even the ancient looking font of Arabic all work to evoke an image of the historical Islamic caliphate, the massive state that ISIS claims to have resurrected. Now that we understand their religious affiliations, let's re-write some headlines to be more accurate and make more sense. Below, I have captured some headlines from 5/4/2015. These are typical news headlines. But what they don't show is the religious affiliations of the various groups. Below each headline is my re-write in blue showing the affiliations. Editorial note: The headlines shown below are from when I originally wrote this article. However, they are still a good example of how Muslims are all lumped to together without any distinction of their religious affiliations. Saudi-led Sunni alliance mulls Partial truces in Yemen with Shia Houthis. 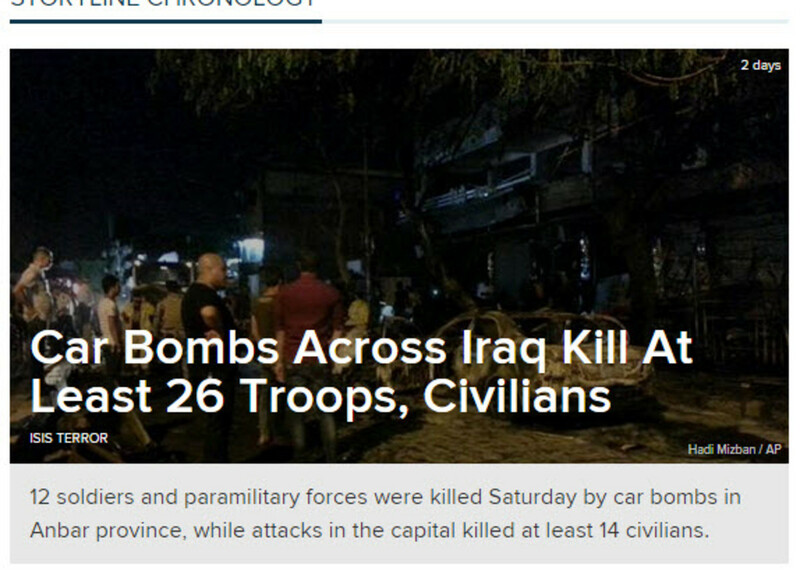 Sunni Car Bombs Across Iraq Kill at Least 26 Shia Led Troops and Civilians. Dozens of Sunnis killed across Syria in Shia led air raids report say. The map above shows the percentage of Shia/Sunni population in the mid-east today. Notice Iraq has a much larger Shia population than Sunni. It is approximately 65 to 70% more than Sunni. And Iran is about 90 to 95% majority Shia. However, Saudia Arabia has about 10 to 15% Shia with the remainder all Sunni. 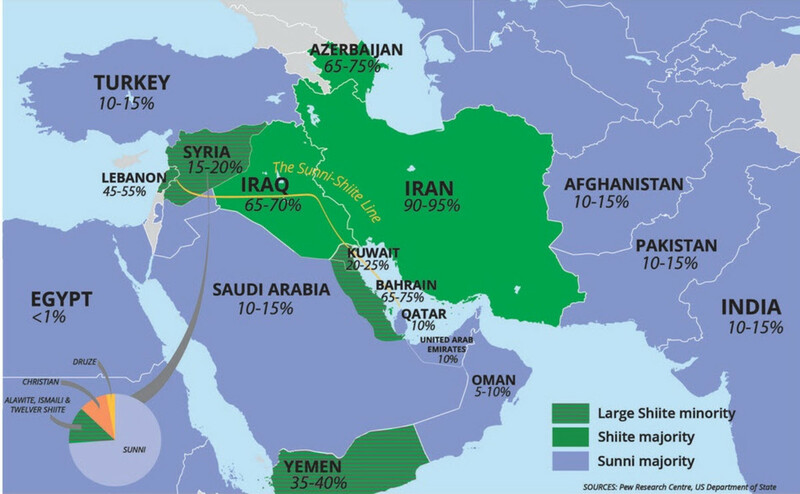 Also notice that the largest percentage in the mid-east is Sunni. Therefore it makes it easier for ISIS to recruit members and control large areas of the mid-east because the Sunni's are the largest population in the mid-east. It's interesting to also note that the largest population in Syria is Sunni, even though it is controlled by a Shia dictator. Saddam Hussein was a Sunni and the majority population in Iraq was Shia. He also controlled Iraq as a dictator. It seems that if you are a leader and your sect is in the minority, you will have to control you country as a dictator. The above map shows the areas of Kurdistan. 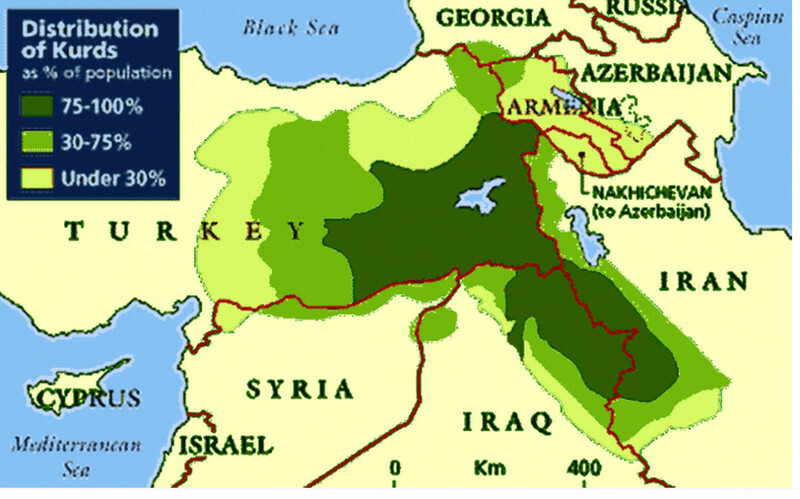 This is where the Kurdish population lives. It is not recognized as a country by the world powers. 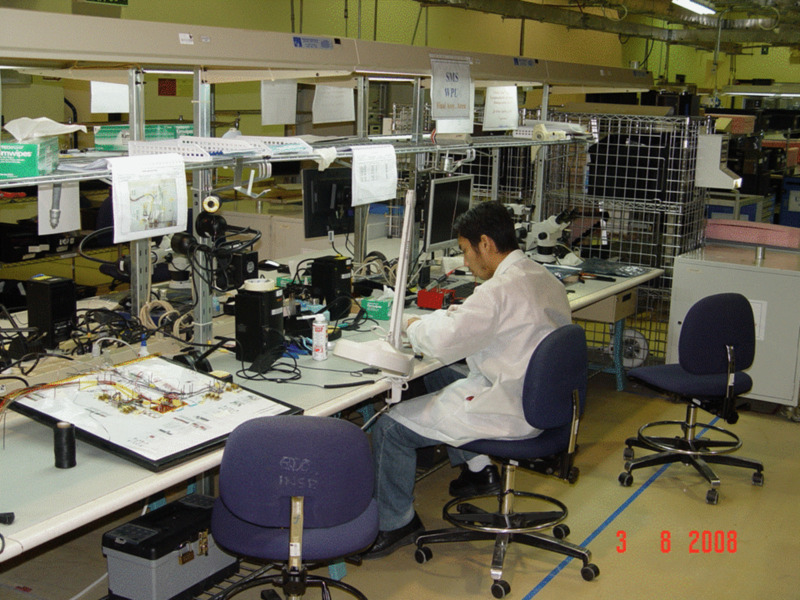 However, it has a very large population that occupies many countries. It occupies parts of Turkey, Iran, and Syria. They do have their own military and have defended themselves against ISIS. I have created the diagram below to show the countries in the mid-east in relation to the their religious factions and their relationship to the U.S. 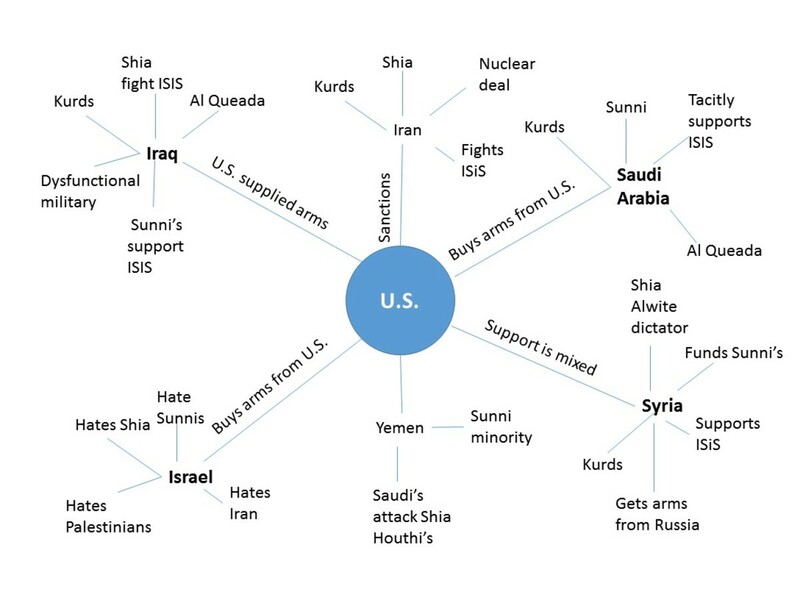 It shows how conflicted the U.S. is by supporting and selling arms to conflicting countries. For example, we sell arms to Saudia Arabia, who are Sunnis who are currently attacking Shias in Yemen. But ISIS is also led by the Sunnis. We are in negotiations with Iran, who are shia, but Saudia Arabia attacks Shia in Yemen. Syria is another story. Syria has a Shia Alwite dictator as its leader, but the population is predominantly Sunni, who leads ISIS. No wonder Obama wanted to stay out of Syria. It gets very confusing because the media and the government call the majority population by its country name and everybody else who fights them are called rebels or militia. So they lose their real religious identity. Sunni's and Kurds make up the minority population of Iraq. While the Shia are in the majority. Their military is dysfunctional as it comprises about the same mix as the population. Therefore sometimes they support the Shia and sometimes they support the Sunni ISIS, and Al Queada. The U.S. supplies them with military arms and training. The majority population in Iran is Shia. They have been known to support Al Queada, but they fight ISIS because ISIS is led by the Sunni's. They have sanctions imposed on them by both the U.S. and the U.N. They also have to deal with the Kurdish population that lives on their borders. A nuclear deal is in process. It will be interesting to see what effect Israel has on the outcome. The majority population in Saudi Arabia is Sunni. They buy arms from the U.S. and they tacitly support ISIS. The 9/11 terrorists including Bin Laden were from Saudi Arabia. 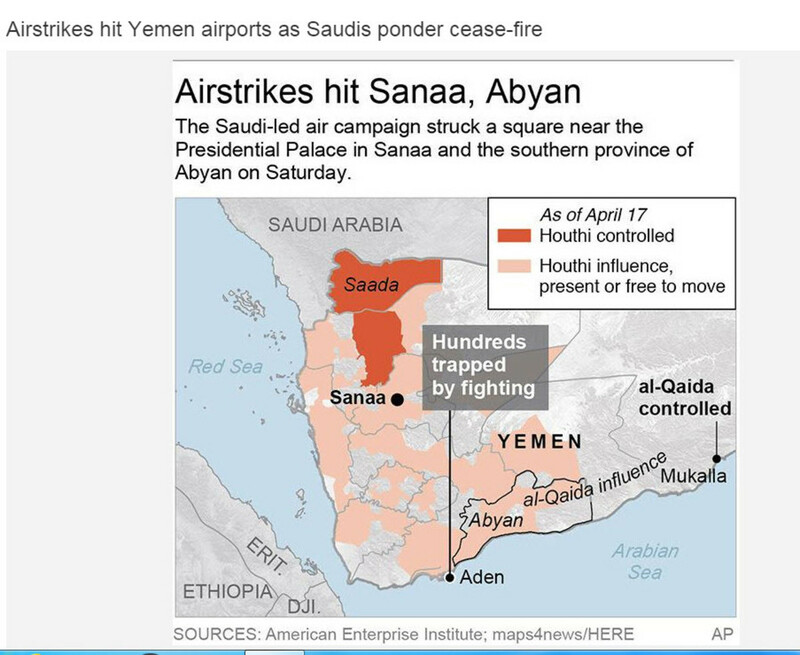 They are currently attacking Shia Houthis' in Yemen. Trump has just struck a deal to supply the Saudi's with arms for over a 10 year period. They in turn will pay us 350 billion of which 110 billion will be available immediately. Yemen shares a border with Saudi Arabia. Yemen's majority population is Houthi Shia. The Saudi Sunni military has attacked the Houthi Shia with arms bought from the U.S.
Israel doesn't like any of the Arab religious factions. They hate Sunni's (Hezbollah) and Shia's (Hamas). They hate and fear Iran and they want the Palestinians to leave Palestine because Israel says it is their God Given right to colonize the Palestinian land. Most Jews believe, God has made them the chosen people; therefore, the Palestinian land belongs to them . They also buy arms from the U.S.
Syria is governed by Bashar Al Assad, a Shia Alawite dictator. The Syrian population is a mix of Sunni, Shia, and Kurds. Except for the Shia Alawite population everyone else are called rebels or militia. Russia has brought in their air defense systems to protect and kill those who do not support Bashar Al Assad, except for ISIS. More recently, they have pulled out about half of their air defense system and reports indicate they are starting to conduct air strikes on ISIS. The bombings in Syria have left many of the population homeless and caused many of the people to leave the country as refugees. I believe that Trump's Travel Ban and the media are doing a dis-service to not only the public, but to the Muslim world by lumping all Muslims into one category. They need to be defined by their religious affiliations and not by their country of occupation. It will then become clear that most terrorists are Sunnis who have been inspired by ISIS or are members of ISIS who are also Sunni. After doing my research and analysis, I believe the U.S. should pull all their interests out of the mid-east and let these people resolve their differences. Borders are drawn by men, but ethnicity, cultures, and religion don't always obey the borders that are drawn. 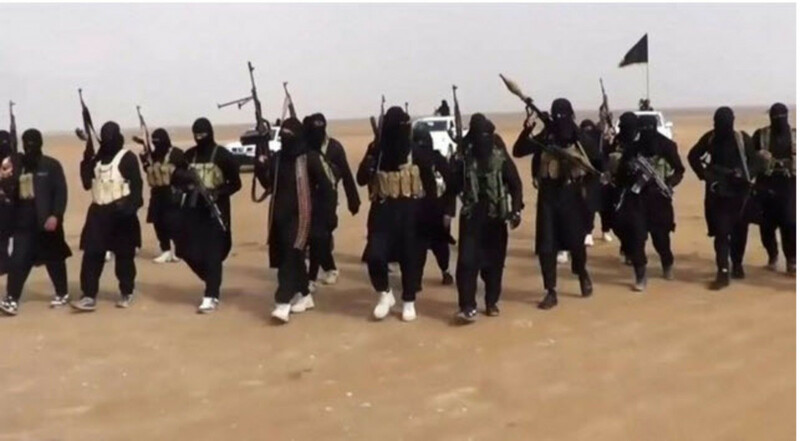 ISIS wants to take the mid-east back to the time of the Ottoman Empire when the region was ruled by a Caliphate. It's obvious that the Sunnis and Shia want their own form of Islam and they are willing to not only sacrifice their blood and treasurer, but also ours. The thinking of our government is that all they have to do is form an inclusive government where all these religious factions live under one roof called democracy. That is not going to happen, because Islam is an ancient theocracy that they follow as their form of government and religion. The problem is the Koran, just like the Bible, can be interpreted by extremists to justify the killings of people to achieve their goals. I hope you have learned something from this article. I know I have and thanks for dropping by. Yes what you wrote is very similar to the wording used on wikileaks. The 4 states solution is on my list to read. ISIS is not a country, but their goal is to become a country. ISIS was created as a result of the fall of Saddam Hussein and the Ba'ath party. His high ranking officers were sent to a prison called Camp Bucca. The mistake that was made is that they were all imprisoned collectively and could meet and plot what they were going to do when they were released. One of the prisoners, Abu Bakr al-Baghdadi, was to become the leader of ISIS. According to the guards, he could be described as a low profile model prisoner, so he was released early. He then joined Al Queda. 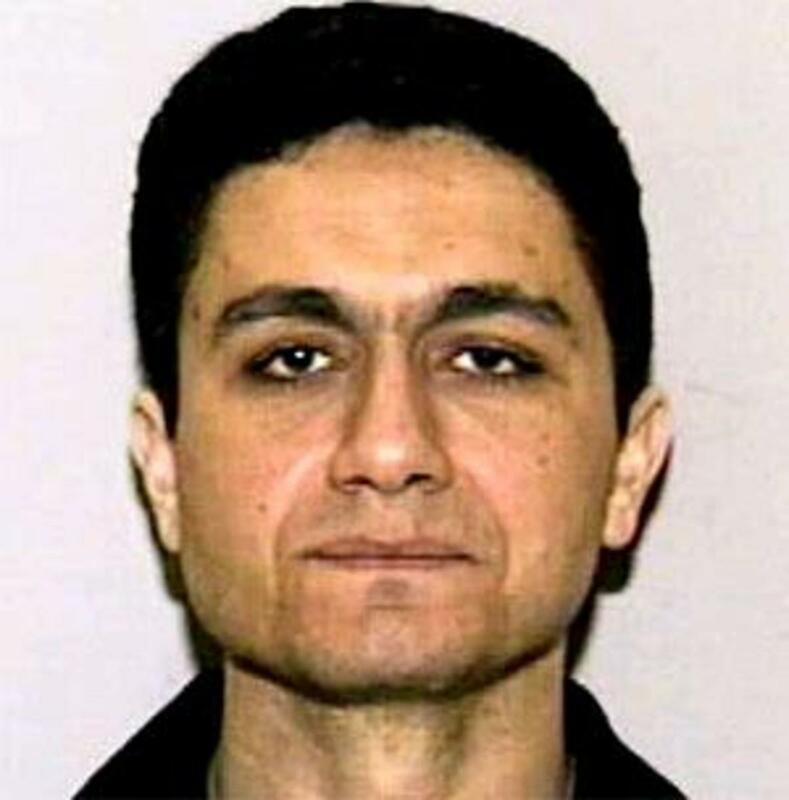 After both of the Al Queda leaders were killed, he took over a branch of Al Queda. But there was a parting of the ways and he formed ISIS. The rest is history as we all know what he is today and what ISIS is doing. The important thing is that he is a Sunni who is known as the Caliphate. His goal is to change the middle east into a Caliphate led country." Here is the link to the article, if you want to read it. Interesting, I did know about the split in islam after Muhammad's death but didnt know the specifics of the terms imam and caliph. I am not sure I agree with the assessment that Isis was part of al queda, since they had different goals and not only split early on, but became competitors. Also not sure I agree Boko Haram was part of Isis, althogh it had an affiliation with Al Queda, I am pretty sure Boko Haram pre-dated Isis. I am still convinced that we (the US) together with Qatar and others created ISIS (or perhaps even the Israeli's (you ever notice how they do not constantly condemn israel when everyone else does?) I think the goal....if we did...is to let them topple Assad and then we topple them. I corrected that Hezbolla is not a Sunni terrorist organization, but a Shia terrorist organization. I added a description about Syria's dictator president Bashar Al Assad and the Russia support of his causes. Blogger5: Thanks for your comments. in doing my research, I did mix up Hezbolla with Sunni. I will change it. There is evidence of Al-Qaeda having elements in Iran, albeit, they don't like each other. Kevin. Thank you for the history lesson and dropping by. I wish more people could understand what is really going on in the mid-east. I don't think most of the presidential candidates have a clue. The Shia do believe that the leader of the Islamic World should be a descendent of Muhammad. That person was the Fourth right guided by the name of Ali ibn Abi Talib, or Ali for short. With the death of Ali, the first and most notable phase in the history of Muslim peoples came to an end. All through this period it had been the Book of God and the practices of His Messenger - that is, the Qur'an and the Sunnah - which had guided the leaders and the led, set the standards of their moral conduct and inspired their actions. The Shia believed in the next leader of the Islamic world so much that they created their own society in Egypt called the Fatimids. Just some extra information about the your topic which was well written and well thought out. Thank you for the hub. Shyron: Thank you so much for the votes and sharing. I'm so frustrated every time I hear or read the news about ISIS. They make it sound like we are losing the war with them. The reality is they are fighting the Shia and the Kurds. They are trying to provoke the U.S. into putting boots on the ground, so that we can be bogged down in another endless war. When you read the news, now think about ISIS being the Sunni extremists who have a vision of taking the mid-east back to the days of the Ottoman Empire ruled by a Caliphate and all of this will start to make sense. If George W hadn't taken out Saddam, none of these would have happened. Mike, this is a very informative hub that helps "ME" understand a bit better who the terrorists are and what religion they represent. Voted thumb up, UAI and shared. Thank you Larry. I hope this shed some light for you on this complex situation. I think one of the factors that makes it complex is we are right in the middle of this three-way civil war. Thanks for dropping by. Wonderful analysis of a complex situation. DWDavisRSL: Your comments have hit the nail on the head. I often think if a simple person like me can understand this, why can't our government? Maybe they do and they just want to perpetuate it for the benefit of the military industrial complex at the expense of our blood and treasurer. Those companies provide much of the campaign financing for our politicians. Now I'm beginning to sound cynical. Thanks for your comments and dropping by. Akriti Mattu: Thank you for the comment Akriti. I'm honored to have someone from India comment on my article. lions44: I never thought about China filling the vacuum. That's an interesting concept. Maybe we should let China try to fill the vacuum, so they can be bogged down in a three-way civil war that seems never ending. Look what Afghanistan did to the Soviet Union for 10 years. Thanks for your comments, votes, and sharing. An excellent and informative Hub. You have done an admirable job of identifying one of the prime fallacies Western countries have about the situation in the Middle East. We in the west are so conditioned to our allegiance to a nation rather than a faith we consistently fail to see how boundary lines drawn by European governments in the wake of WWI are basically ignored by the ethnic and religious groups that populate the region. Until we come to understand this, our government will continue to waste our wealth and soldier's lives attempting to bring peace to a region that has not known peace, perhaps ever. Excellent piece. Religious fundamentalism is engulfing the world. Great analysis. I hope we can pull out of there one day, but I just don't see it anytime soon. Although we are essentially energy independent, the rest of the Western world is not. Iran is becoming a bigger power despite the nuclear deal. That's not good. If we were gone, China would fill the vacuum. Voted up and shared.